IL DIVO wallpaper.-. . HD Wallpaper and background images in the Il Divo club tagged: il divo wallpaper fan art. 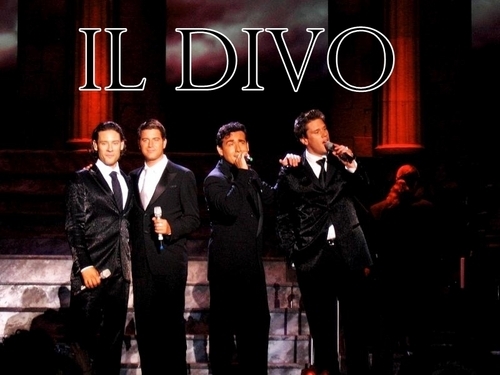 This Il Divo wallpaper contains बिजनेस सूट, अच्छी तरह से तैयार व्यक्ति, सूट, पैंट सूट, pantsuit, पैंट्सट, and अच्छी तरह से कपड़े पहने व्यक्ति. There might also be सूट, कपड़े का सूट, ड्रेस सूट, पूरी पोशाक, tailcoat, पूंछ कोट, पूंछ, सफेद टाई, सफेद टाई और पूंछ, पोशाक सूट, पूर्ण पोशाक, टेलकोट, पूँछ कोट, पट, and संगीत कार्यक्रम. Il Divo and One Direction at Red and Black. "Il Divo behind the scenes at America's Got Talent"
On set rehearsing for "Red and Black"...fun fun fun!!! Sarah Miller: रात का खाना with my lovely husband on our two साल anniversary! Wicked Game Tour - Final Dates Announced!